Words & Music to The House of the Rising Sun are from a Traditional Folk Song. The song was arranged by Alan Price from the band, The Animals. It was recorded May 18, 1964 and released June 19, 1964 in the UK and August 1964 in the US from the album The Animals. Level Of Ease: Easy - the timing is a little tricky at first but you get used to it pretty quickly once you get the hang of it. Key Signature: C Major / A minor... the song seems to take a little out of both key signatures. For intermediate and advanced players who may be interested - here's a little excerpt I found in a forum at guitar-music-theory.com. It is written by Desi Serna, a noted & respected author on guitar theory. It helps to clear up some confusion relating to the key signature of this song. 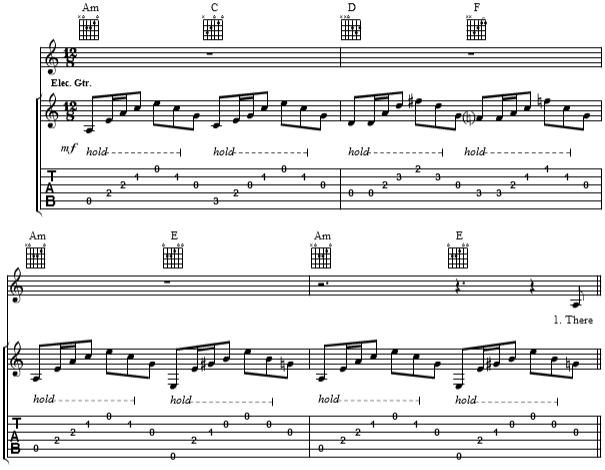 The guitar chord progression to "House of the Rising Sun" by The Animals includes chords from more than one scale. The Am, C and F all fit into the C major scale (A Natural Minor or Aeolian Mode). The D chord requires an F# note. This could be thought of as stemming from the G major scale (A Dorian Mode - A B C D F# G) or A Melodic Minor scale (A B C D E F# G#). The E7 requires a G# note. This changes the scale to A Harmonic Minor (A B C D E F G#) or A Melodic Minor scale (A B C D E F# G#).. If you use the 4/4 time signature, each beat of the bar is treated as 4 x eighth-note/quaver triplets (a group of three notes is played in the same time as 2 notes of the same kind OR three evenly spaced notes played in one beat). Therefore a bar which you may normally count as | 1 2 3 4 | OR | 1& 2& 3& 4& | would now be counted as | 1&& 2&& 3&& 4&& | etc. with chord changes generally occurring on the 1st and 3rd beats of each bar... the following chart shows you a sample of the timing in triplet segments... the count includes rests which are actually the bass notes in the bass clef - written for piano. Please Note: The chart represents 'cut time', written as 2/2 (2 half-note/minim notes per bar) which is clearly played by the notes in the bass clef. 4/4 time signature is discussed here to show each set of triplets clearly as 1beat. This could also be given a key signature of 12/8 which would look like this - written for guitar. There are 12 eighth-note/quaver beats per bar. This can still be counted as above with 12 segments per bar. If you use the 6/8 time signature, there are 6 eighth-note/quaver beats per bar and each bar count is simply | 1 2 3 4 5 6 | etc. with chord changes occurring on the first beat of each bar... it would look exactly like the 12/8 time above except that each bar is halved with a chord change for each bar. We have used the 6/8 time in our song sheet for simplicity with 1 chord change per bar. The fermata / pause symbol - the last chord of the song is strummed and held till it rings out. 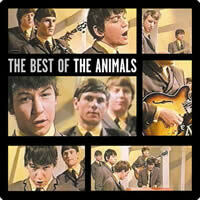 THE ANIMALS chords and lyrics are property and copyright of their owners. "House Of The Rising Sun" chords and lyrics are provided for educational purposes and personal use only.